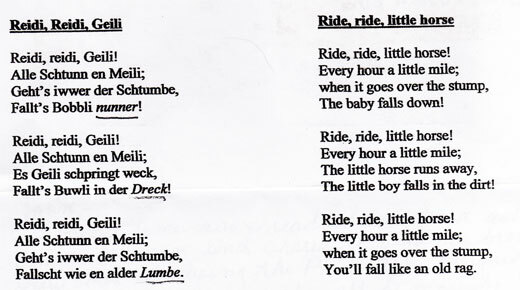 Some months ago, I asked on behalf of longtime reader Dianne if anyone could give her some info on a Pennsylvania Dutch nursery rhyme that her grandfather used while bouncing granchildren on his knee. I cannot believe the great responses I got! I am so appreciative. One thing I mentioned in my earlier post is that I can find MANY variations of this rhyme, so while these answers vary, I believe them to all be “correct,” just variants on the theme! And pour ourselves a little gin. Indeed he was, and I am very thankful! 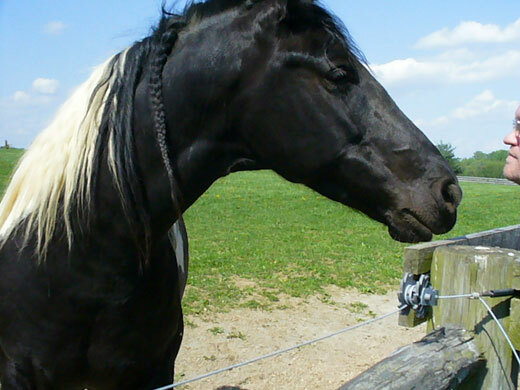 In order to (something) fodder for the horse. He says, “I’m sure you’ll get a lot of responses that will be far better than this. But I had to give it a try.” Roy, I’m glad you did! This is much closer than I was able to come directly matching Dianne’s version of the rhyme. Thank you! Thanks to the MANY readers who were able to shed some light on this. Dianne, I hope it is helpful! Thank you for posing such a fun challenge! Oh, we haven’t talked about pig parts in a while!